While this is not strictly a separate category of paranormal photograph, we don't receive many photographs for analysis that were not originally captured on digital media, so we feel a new section is justified. Also, film photographs are a little more difficult to analyse because we don't have exact data about the shutter speed, lens aperture, flash mode or other information that is contained in the Exif data attachment with most digital photos. There is also a different set of things that can go wrong, perhaps producing false positives. Light leaks, chemical processing marks, accidental double exposure and ageing damage are not things that occur in digital photography but could show up in silver-based photographs as paranormal-looking effects. The photographer says, "The picture was taken through a window using a Polaroid camera. I was the only person in the room at that time." 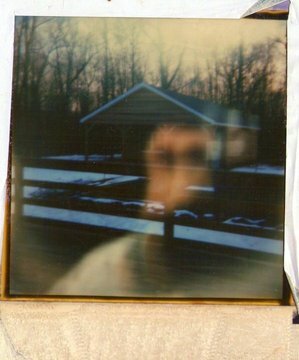 The Polaroid photo appears to be a combination of an outdoor scene and a distorted reflection in the window pane of something or someone inside the room. 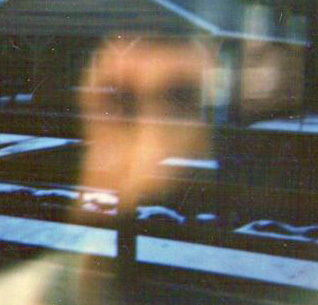 However, the figure reflected in the window is not the photographer, so who - or what - is it? Like a digital camera, a Polaroid camera gives (as good as) immediate feedback of the photo contents, allowing the photographer to check what is going on at the time. If it was her own reflection in the photo, the photographer would have noticed. She took the photo more than 20 years ago and says it has haunted her for her whole life since. Polaroid cameras can operate without flash down to (automatic) shutter speeds of several seconds. With the low light conditions evident in the photo, it is likely that the exposure could have been quite long, introducing the factors of blur and distortion due to camera and (possibly) subject movement. There appears to be a person reflected in the window, but it could be something else that resembles a person (visual pareidolia). It's difficult to say with any certainty; we'd only be guessing as nothing can be verified. It's not helpful to try to analyse the photo further much than we have here because the physical circumstances around its taking cannot be examined. It remains a beautiful and indeed rather haunting photograph.